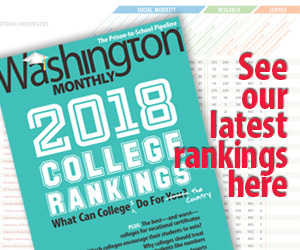 Washington Monthly | Why Do Colleges Care if You Gamble? Why Do Colleges Care if You Gamble? College Guide has written before about the interesting battle going on with regard to Ultrinsic, a Web site where students can make money betting on their own grades. This argument always seemed a little weak to me (does Super Saver run faster if more people bet that the horse will win?) but I wondered what colleges’ hostility to the website was really about. How does Ultrinsic pose a threat to higher education institutions? It allows an external group to collect a ton of information about students’ academic performance at various institutions, in various departments, with various instructors. If Ultrinsic were able to collect enough academic data, it might give those data sets to other groups that could search for grade inflation, achievement gaps, and low performance among academic units and instructors, causing embarrassment for professors and increased awareness among policymakers. Because if people know which classes are easy and which are hard and where students perform well or perform badly, they might actually be able to compare schools, objectively. Transparency like that seems to be something colleges very much wish to avoid.